OMEGA’s LC204 Series Load Cell is designed to be surface mounted with the load applied through the mounting stud. The high linearity (0.15%) and all stainless steel construction of the LC204 make it ideal for industrial and commercial weighing and force measuring applications. The LC204 is also available in metric configurations, with ranges from 0-100 to 0-50,000 N and metric threads. Please see the LCM204 for complete details, or contact our Sales department for more information. 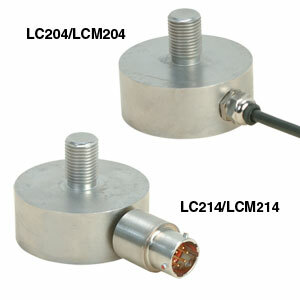 Nota: All LC204 Series load cells include a 5 point NIST traceable calibration certificate.